These images of Marilyn Monroe are from 1945. 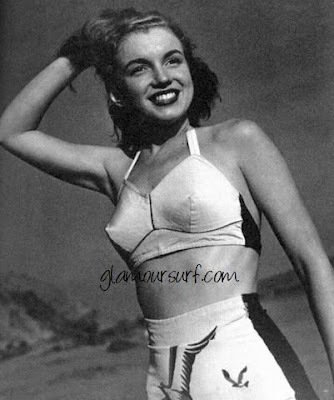 Marilyn modeled for Catalina early in her career. She's wearing a 2 piece hand print swimsuit by Catalina. 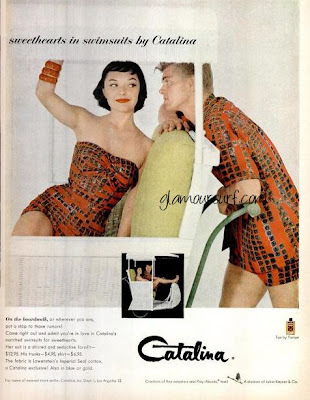 Catalina produced many design patterns on these type of suits in the late 1940s. Some of them are made from Bengaline, some of satin Lastex, Prospector Rayon and some of Celanese Rayon. Each pattern had a name and each print is called a hand print. 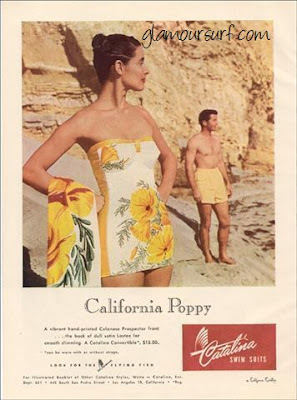 This particular Catalina swimsuit print is called California Poppy. We have it available at Glamoursurf here. There were also his and her sets created called Sweethearts in Swimsuits. 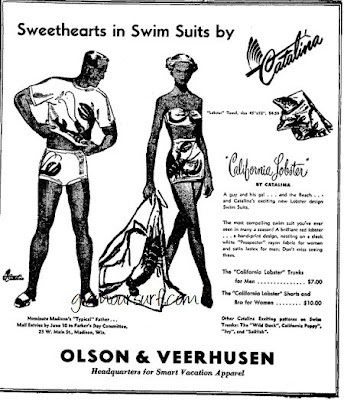 Mary Ann DeWeese was the designer for Catalina at this time and she is responsible for launching the Sweethearts in Swim Suits line of swimwear. This ad is from 1948. This ad for the California Lobster is from 1949. It mentions to look for other patterns called California Poppy, Sailfish, Ivy and Wild Duck. This is the Wild Duck Pattern made of Lastex. 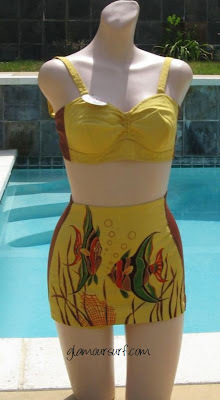 This cute two piece suit is called 'Hawaiian Fish'. 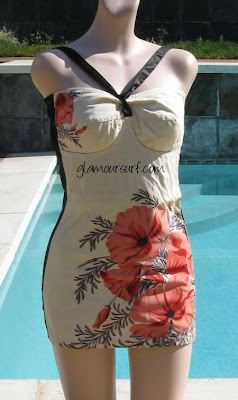 This is a fabulous new with tags suit also available at Glamoursurf. 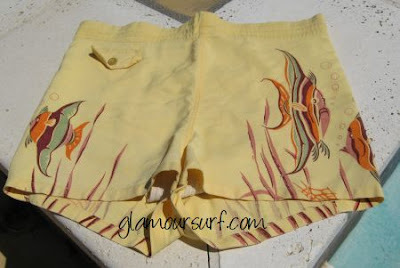 We are also lucky enough to have the matching men's trunks at Glamoursurf, so with that you and your beau could be sporting a true Sweethearts in Swimsuits look! Here are some more patterns from this line. Aren't they wonderful? 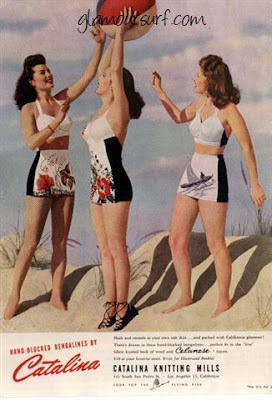 The Sweethearts in swimsuits line continued into the 1950s. The Pharoh ad above is from 1955. And a final look at one from 1956. These suits are made from Imperial Cotton, a Catalina exclusive. I'd say the Sweethearts line was very successful! Do you have a favorite? How cute are those suits! I wish it was summer. What fabulous swimwear Catalina made! Great blog, and to think you have those swimsuits for purchase!! Wish my figure were ready for them! Loved seeing all of these!